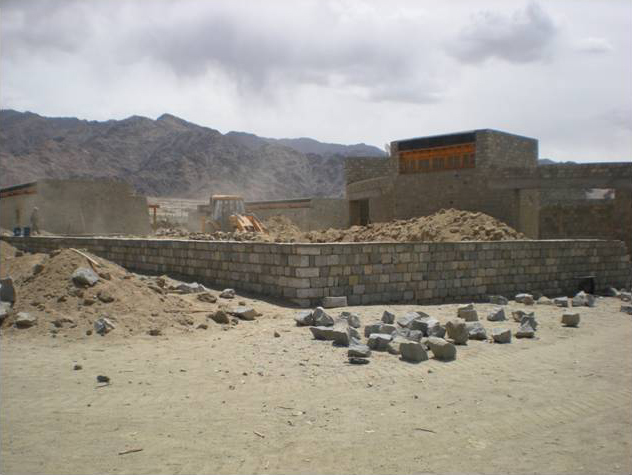 This year has seen the South block of Residence 4 constructed, from the foundations being dug through to completion, accommodating 44 students and including a latrine block. The two-IT suites pictured below have also been completed, and facilities for the School Managing Committee are being built on site too. In order to landscape the school campus and create gardens, the site needs irrigating. A drip irrigation system is being installed that requires digging trenches throughout the site for the main water pipes. The JCB has been invaluable for this work. 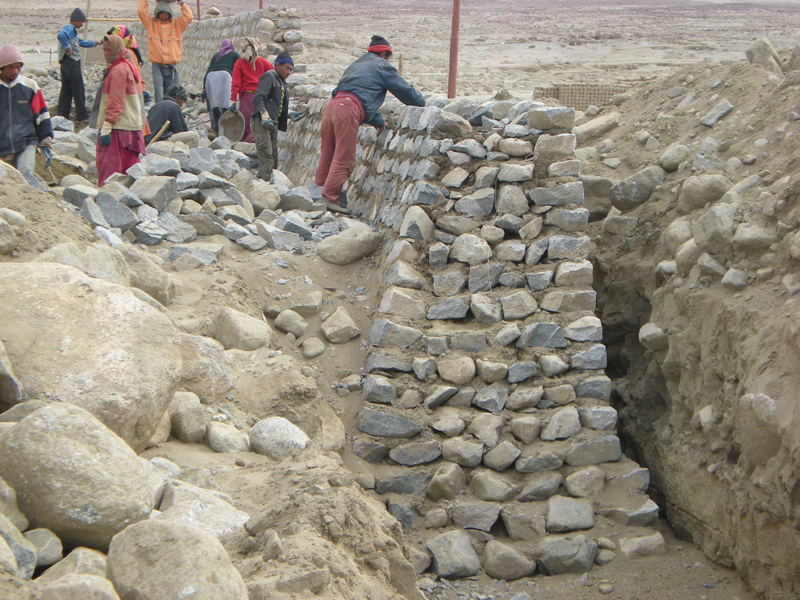 The final components of the 1km long defence wall are finished, this has been a huge undertaking and taken two years to complete. The wall averages 3m high. 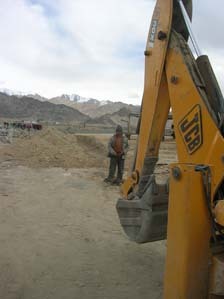 The JCB digging foundations at the beginning of the construction season in April. 2012 was a busy year. 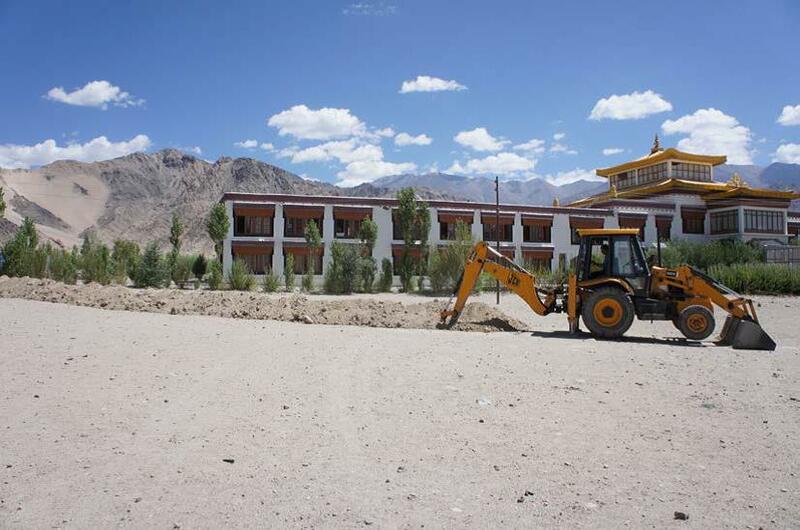 Two IT-enabled classrooms were built, plus the North block of Residence 4 which will accommodate 44 remote area students. 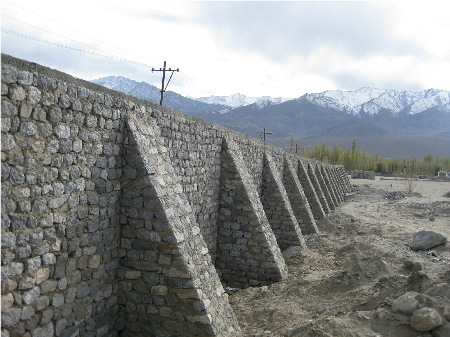 The masonry work on the mudslide defenses was also completed, the wall now being about 1km long and up to 3 metres high. A huge congratulations to the Construction Team. Below: IT-enabled classrooms being painted and completed. Below: Residence 4 under construction. Below: The defensive wall to protect from any future mudslide event. Below: The local Construction Manager (right) and UK Development Manager (left). 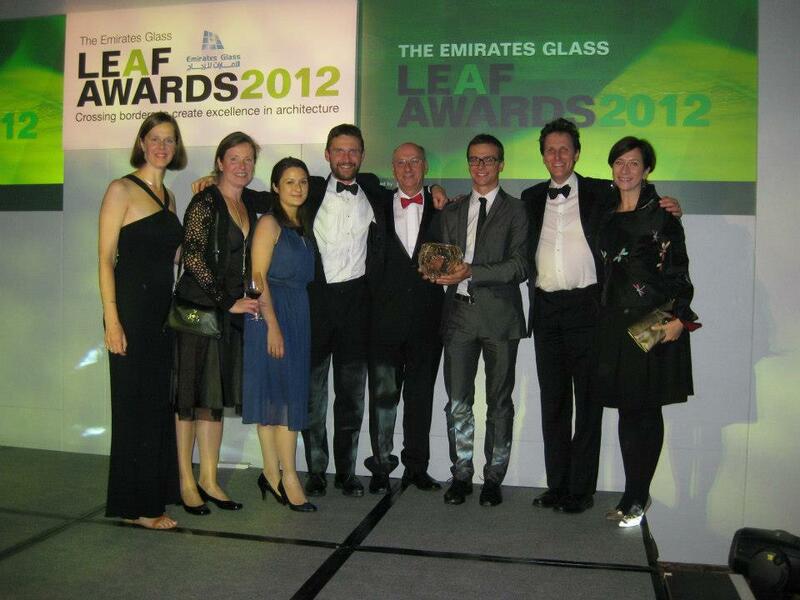 Druk White Lotus School and Arup Associates received The Emirates Glass LEAF Award for 'Best Sustainable Development' on 21st September 2012. 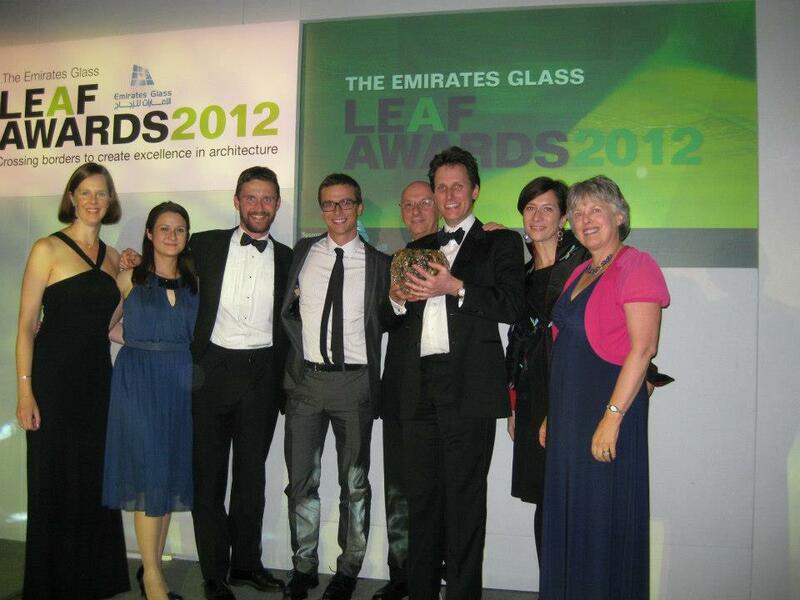 Rachel Glynn and Sean Macintosh accepted the award on behalf of the team. Former Resident Engineers Dorothee Richter, Francesca Galeazzi, Nicola Perandin, Suria Ismail and Rob Baldock were there too. 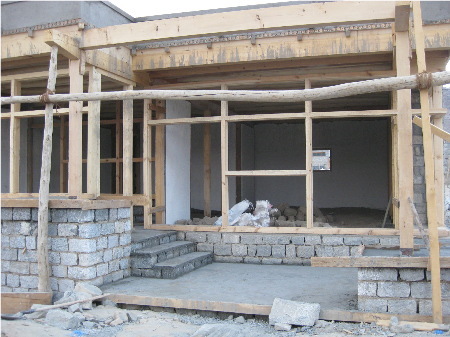 During the summer of 2010, a volunteer group of US architectural students from BaSiC Initiative came to the school. One of their projects was to design, fabricate and erect a large canvas tent structure from recycled parachutes. The structure was then taken to London and re-erected in the garden of Marlborough House as the Commonwealth Pavilion during The Earth Awards and His Royal Highness The Prince of Wales' START garden party in September 2010. 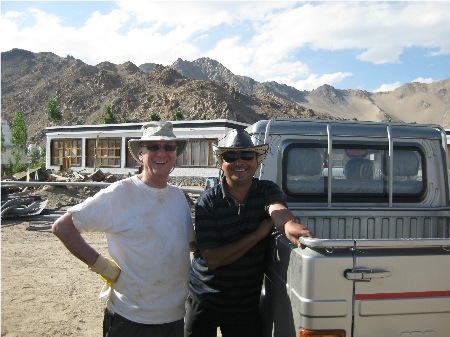 The Pavilion will return to Ladakh and take its place on the Shey campus once again in 2011. 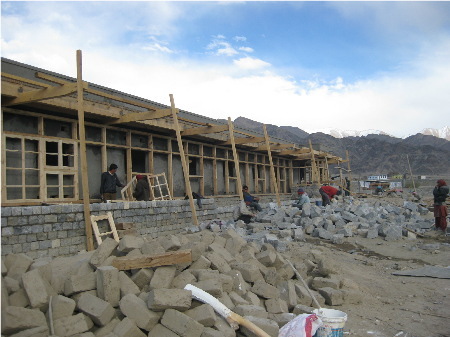 Construction after the long winter started again in April 2012 with work on two Secondary School classrooms, finishing the defensive structure on the Eastern boundary and work on landscaping the school campus. The North block of Residence 4 will be starting soon too - a very busy summer construction season for Angdus (Construction Manager) and his team. 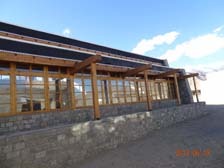 The excellence of Arup Associates’ design work on Druk White Lotus School was recognised on 4th December 2009 in Hong Kong through the presentation of a ‘Design for Asia Grand Award’. The award was accepted by His Eminence Khamtrul Rinpoche on behalf of the School and by Francesca Galeazzi on behalf of Arup Associates. “It is both awe-inspiring and humbling to be here in Hong Kong tonight to accept so prestigious a design award on behalf of the Druk While Lotus School, and the people of Ladakh. It is really hard to believe that our tiny, remote and isolated Himalayan region has succeeded in winning such international recognition. 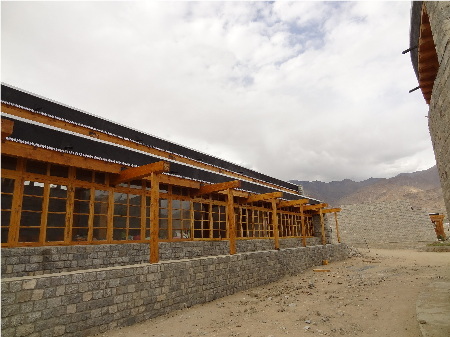 We have so much to thank for the inspiration and creativity of the multi-national group of designers from Arup Associates, who contributed so much to create Druk White Lotus School. Thank you from the bottom of our hearts. Two secondary school classrooms started manifesting on the campus during September. 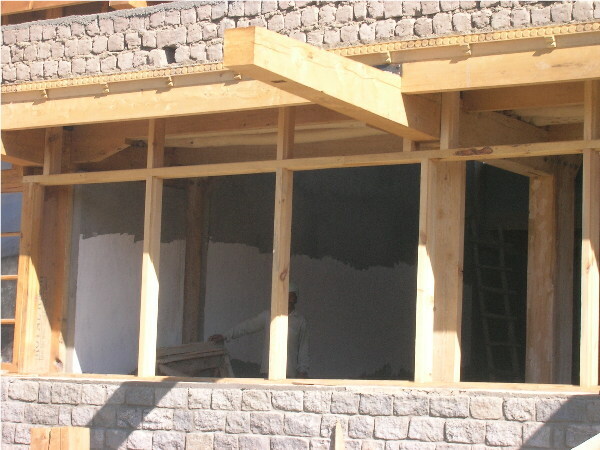 Of course a lot of work had already gone into building the foundations and pre-fabricating window frames, but the skill of the carpenters was a joy to see. The classrooms will be in use from November. 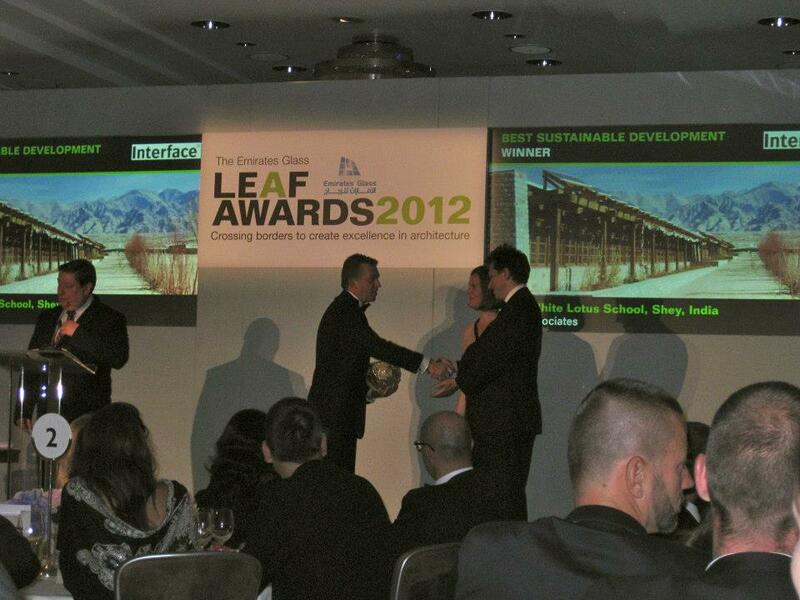 Arup Associates has won an international award for ‘Inspiring Design’ for their work on Druk White Lotus School. The competition was arranged by the British Council for School Environments (BCSE). 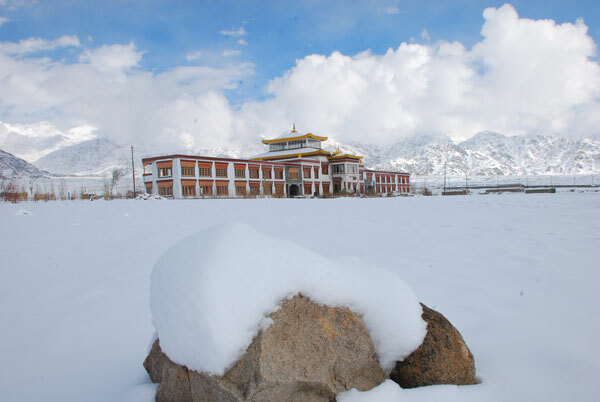 Several articles have been written about the design of the planned Pema Karpo Library at the very cenre of the campus. You might like to read these at Inhabitat and BD Online and Arup Associates. 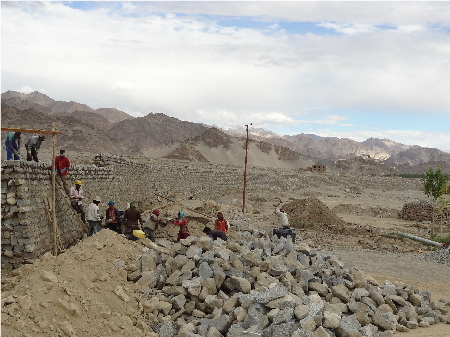 Angdus has built the whole school, assisted by his trusty caretaker Lobsang, and many skilled masons, carpenters and labourers. Angdus is from the local village of Shey, and is married with two daughters. Pictured below are Angdus with Rachel Glynn (Drukpa Trust Secretary from the UK), and Angdus with his second daughter, Tseskit.